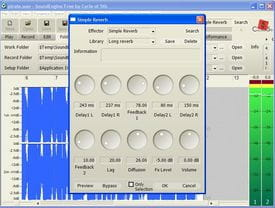 By KeNji Software, SoundEngine is a full-featured application enabling to record and edit sounds. Detailed below are some of its main features. SoundEngine can record voice, music that is being played on your computer system. The process can be performed in a matter of minutes. Once recording done, you are allowed to edit it and add some improvements to its quality. Since users are given the possibility to edit audio files and recorded audio files, there are some options. It offers a real-time preview, analysis and visual function, cache function and more. SoundEngine also offers to adjust volume in batch processing and the adding of effects and transitions. Supported formats are not clearly specified in the editor's website. Nevertheless, SoundEngine supports WAV or WAVEform audio file format is supported. And this means a lot in multimedia world. The interface of SoundEngine is one of the most intuitive. Speed, volume, position, all menus are graphically displayed on this same interface. It is also integrated with a built-in player with options to pause, stop, play and next. SoundEngine does not require special knowledge in this field. Latest update on December 9, 2014 at 04:05 AM.